I love a good statement watch. The big watch face was introduced a bit ago, then the rose gold, now the smaller watches are coming back…but my latest favorite is the mixed metal GOLD and BLACK. Loooovvee them! These are all from Nordstrom.com, click on any picture to take you straight to the site! The middle one above is called “Bradshaw” from Michael Kors. As I have an old episode of SATC playing in the background while I write this, I can’t help but smile, as this one was my favorite one already! Writing this is making me watch crazy! Literally, I want all of these. Of course my favorite is the Michael Kors “Bradshaw”, not only just because of my attachment to SATC . I hope you like them as much as I do! 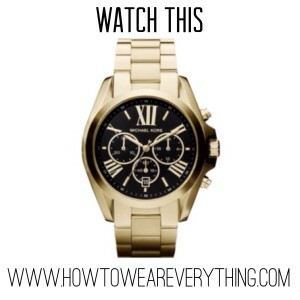 Get a black and gold watch as soon as possible! You’ll be ahead of the trend and all your friends will so impressed that you knew what the next big thing was in watches. I promise!